I’ve been loving the tassel jewelry trend this summer! While I’m still coveting these Lisi Lerch earrings I’ve found an alternate for much less! 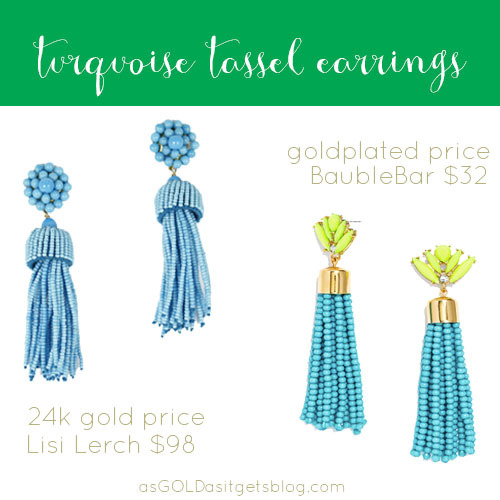 Yes, you read that correctly finally a more affordable version of turquoise tassel earrings! These acid fringe tassel earrings from BaubleBar are so pretty and at a much friendlier price point. They surprisingly are light and really, you hardly feel them at all! You should have no problem wearing them all day or night. Categories: Good Looks | Tags: BaubleBar, earrings, jewelry on a budget, lisi lerch, preppy, tassel earrings | Permalink.